Never too old to stay young! 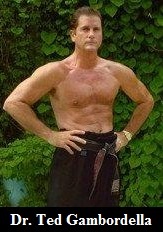 Ted Gambordella is 71 and is one of the Fitness Men in the World! I have done over 7 million sits ups and still going strong. Ted is the author of 42 books and 39 DVD’s on martial arts/fitness/motivation and is considered a living legend in the martial arts and fitness world. He is in the Martial Arts Masters Hall of Fame, and 7 other Martial Arts Hall of Fame’s. Ted is one of the founding members of the Personal Trainer Hall of Fame. Ted began his lifetime fitness quest at 15 years of age and in when he turned 60 he did his 5 millionth sit up average about 350 a day for 45 years. Now he has upped his workout regime and did 1 million sit ups at the Lifetime Fitness Club in Dallas in the last 5 years, averaging a little over 550 a day. Ted says he does not count the sit ups, but just watches the clock. He usually does 15 to 30 minutes of sit ups a day, averaging about 1 sit up a second, so he easily makes the 550+ a day. 1. Eat Right bad food in bad results out. You don’t have to eat organic, or be a great cook, and you can eat at fast food joints, if you don’t eat the bad stuff..like the french fries. 2. Exercise Daily. You can’t just think about exercising, or do it 1 day a week. Find the time to do at least 30 minutes a day, every day.for life. You need to do aerobic and resistance training daily. Too many people just run, and that really doesn’t do much for the muscles. 3. Flexibility. You don’t have to be and old person, bent over and shuffling along. You can stay flexible for life, if you just do a few simple stretches every day. Only takes about 5 minutes. Ted’s likes to say everyone gets older but you don’t have to get old. I CRACKED THE FITNESS CODE! Test What’s the Fitness Code? I Know these Secrets. I cracked the Code and now I am offering this Amazing 3 Step Fitness Code Package to You! I look Better at 60 than I did when I was 30. I can Help You Look and Feel that way Too!